When we decided to adopt the Nirahara lifestyle, little did we know that people’s first sterotypical reaction was that Niraharis are society misfits. How would one live as a Nirahari (which seems very austere and bereft of delicious food) and still be a good wife, husband, boss, employee etc? But we tell you Nirahari’s are over-fits in a society. They stand out as leaders in a land of lambs. 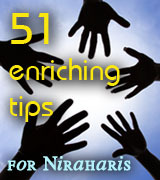 Niraharis excel in each role effortlessly, why? The logic is simple, to be a successful Nirahari one has to follow a life of living by the 4 truths of Authenticity, Integrity, Responsibility and Enrichment. The gift from living in Integrity is positivity. The gift from bringing authenticity into all our actions is space of possibility. The gift from taking responsibility for everything we experience and do not experience is Ishittwa (Leadership). The gift from enriching yourself and others is enlightenment. Why will any human trained to live such great truths not do well in life? There is more to a food free life than you know! 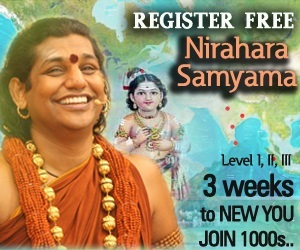 The Master Paramahamsa Nithyananda says that – “Ecstasy is the space of possibility in you”. The space where impossible is i’m possible. People believe it is impossible to live without food. So what happens when you do? That too for 21 days under the guidance of an Avatar? Your body rejoices in the understanding that it truly does have the ability to live without food and evolves into adopting a full fledged Nirahara lifestyle. Nirahara creates that space for a new “possibility”. This a big reason why many participants suddenly experience healing of various physical and mental ailments,because when the body jumps to its highest possibility, it retains no room for old patterns of disease. When the intense inspiration and excitement sink to the depths of your bio memory, when you feel the space for “possibilities” – that’s called BLISS. We play multiple roles and responsibilities as a human: son, daughter, brother, sister, father, mother, husband, wife, employee, boss, friend, etc. Physically, women who completed Nirahara Samyama become healthier, especially if they were previously dealing with obesity, joint pains,etc. Needless to say, when people give up food after THE Samyama, they find more time for themselves and when spare time is used to indulge in creative pursuits it helps a person find joy and meaning in life. Of course it is vital to go on building the Nirahara experience and that process becomes easy if one has decided to help themselves. Women especially can experience relief in range of menstrual problems and find overall improvement in stamina. So no more feeling of frustration and stress for them! Contrary to what people think Nirahari parents develop more patience and compassion to spend more quality time with each other and their children. Children inturn see and learn the benefits of such a spiritually centered lifestyle free of internal conflicts . Kids infact are highly authentic by nature and their bio memories tend to pick up the best lifestyle they see around them. And what do you think they pick up from their Nirahari Parents? 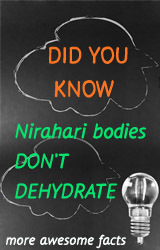 The individual living a Nirahari Lifestyle starts experiencing 1000 fold increase in physical energy. They experience living in a disease free body. To share a live example , a lady living in USA was on treatment for anaemia and calcium deficiency prior to the Nirahara Samyama program. After undergoing the Nirahara Samyama program her medical test reports showed an increase in her iron levels and vitamin D. Her Doctors were naturally surprised.Many other participants have also reported significant health changes. When people experience healing and the resulting expansion of their bodies, all they want to do is enrich lives of people around them with the gift of their experience. As a professional such a Nirahari works with much more capacity, feels fulfilled, has multitasking abilities much to the perplexed stares of his/her peers. Psychologically his or her creative and innovative abilities superseed the abilities of non Nirahariss with ease. Since they have themselves experienced a space of “possibility” within them, any project, any task becomes possible. A Nirahari never shies away from responsibility and his/her leadership is felt like an aura that influences all. Truth be told, Niraharis even forget the definition of stress, hypertension, migraines, professional jealousy and especially the weird phenomenon called depression of success, midlife crisis etc. Even with regards to sleep, Niraharis enjoy good quality sleep spanning a maximum need of just 3-4 hours.Over the time sleep hours further reduce and no, the health of a Nirahari does not get adversely affected by the reduced quantity of sleep. 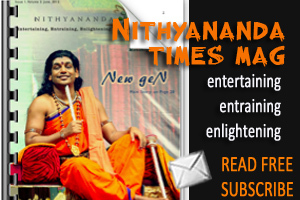 Nirahara lifestyle awakens the various non-mechanical centers of the brain. “Asaadhyahi asaadhya hi saadhya hai” – Impossible is impossible is possible. Such an individual starts expressing certain extraordinary powers or Siddhis. Transformation happens on a different plane. He plays with life with heightened intuitiveness, intensity, awareness rather than wasting time on deep thinking, over -analysing, etc. Such a person’s bio intelligence will be in an awakened state. In a normal human being two strands of DNA are active at most. But by constantly living the Nirahara lifestyle & its practices more strands of DNA are awakened. As the Master works on him or her and the Master’s Bio Intelligence itself gets transferred to the individual. All in all its a good lifestyle to look forward to !